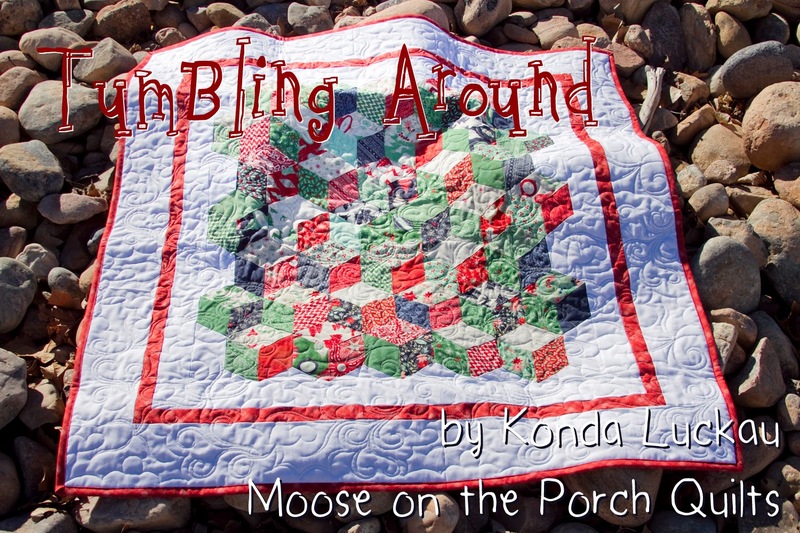 My name is Konda Luckau of Moose on the Porch Quilts. 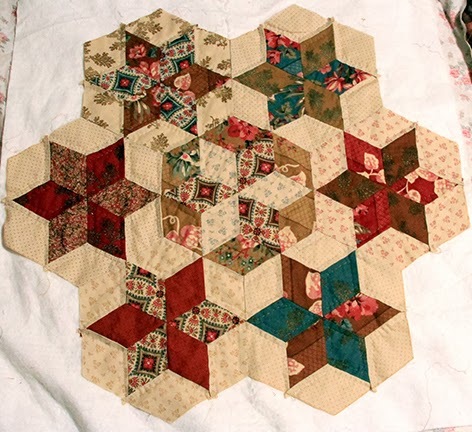 I have been quilting for a long time. 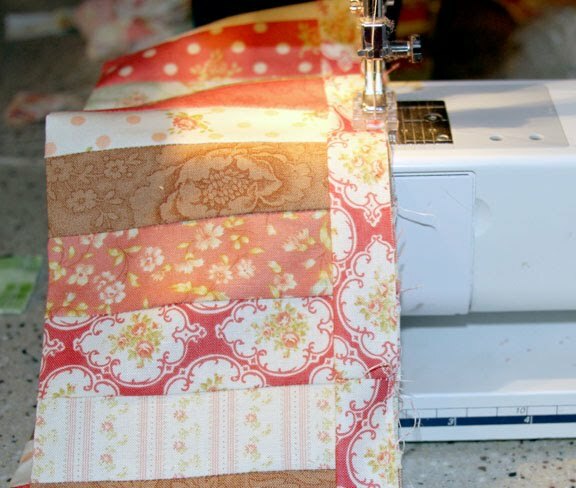 In the past, I have always said that the only reason I can quilt is because I could do everything on a machine. 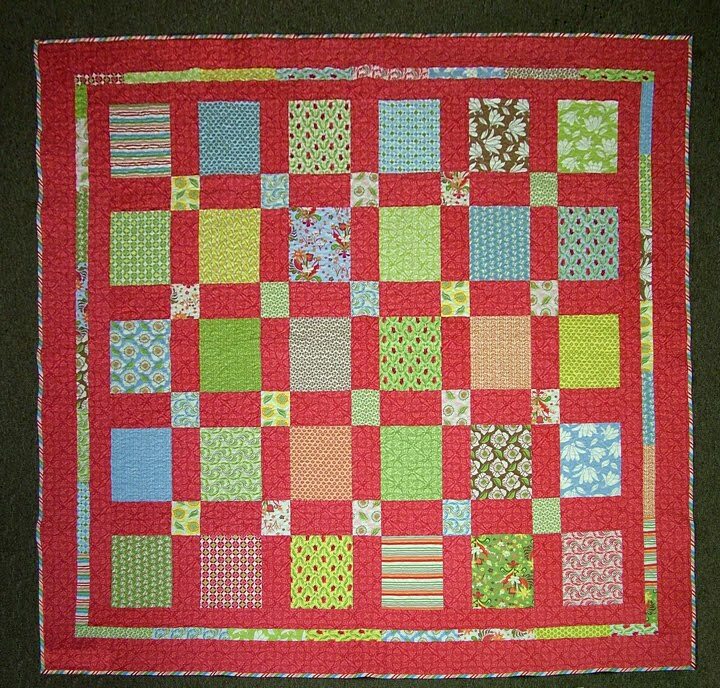 With 6 kids from 4 – 14, I don’t always get as much time to quilt as I would like. 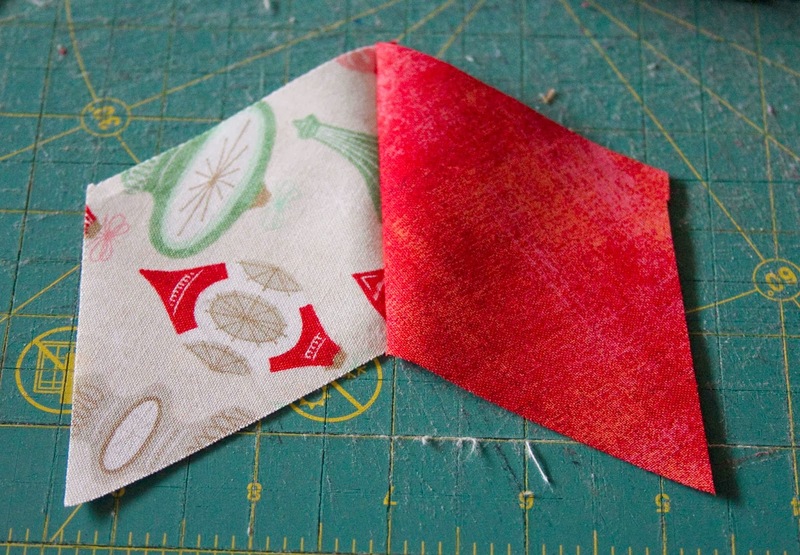 I love precuts because I can start sewing faster. I love quick projects because I can actually get them finished. I have recently been changing my mind. 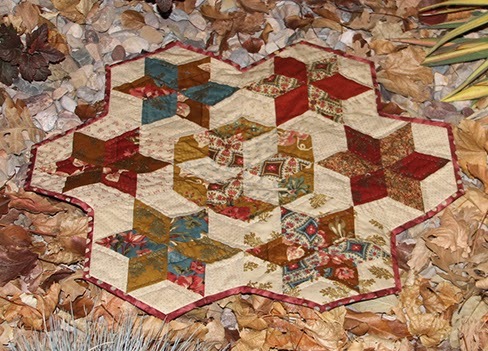 I still like to see projects finished, but I have tried hand piecing and hand quilting. I started small. I found that hand applique is too slow of a process for me. Hand piecing surprised me. I enjoyed being able to work on it while waiting for kids in various places. If you haven’t tried hand work, this might be a project to change your mind. 1. Take 28 of the hexagons, 14 light and 14 dark. 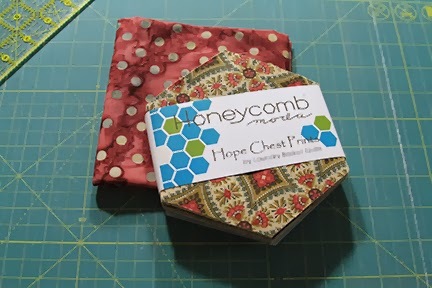 Each hexi star takes 2 light hexagons and 2 dark hexagons. 2. Cut each hexagon into three diamonds as shown. Using a ruler from corner to corner, cut half way. 3. Turn the hexagon and cut half way again. Repeat to make three diamonds as shown. 4. Take 2 sets of 3 light diamonds and 2 sets of 3 dark diamonds for one hexi star. 5. 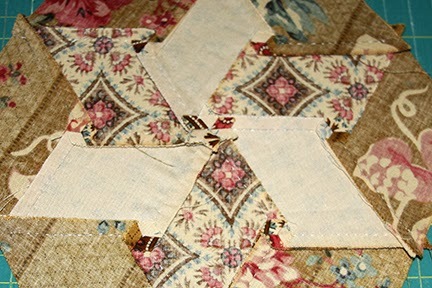 Lightly mark the 1/4″ seam allowance on one of each dark diamond in a narrow V as shown. Lightly mark the 1/4″ seam allowance on all 6 of the light diamonds in a wide V as shown. 6. Lay out half of the star with the marked diamond between two unmarked diamonds. 7. Align two adjacent diamonds. 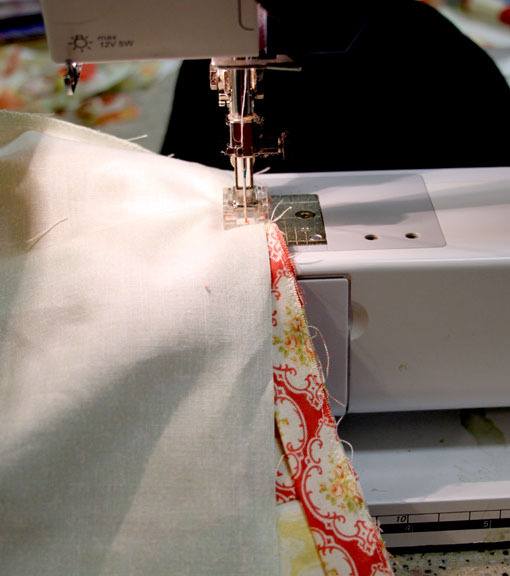 Sew with a running stitch along marked line. 8. Tie off the thread at the corner and align the next diamond. Continue sewing down the next side. Tie off and cut thread. Finger press. 9. Repeat with the other three dark diamonds to make two half stars as shown. 10. 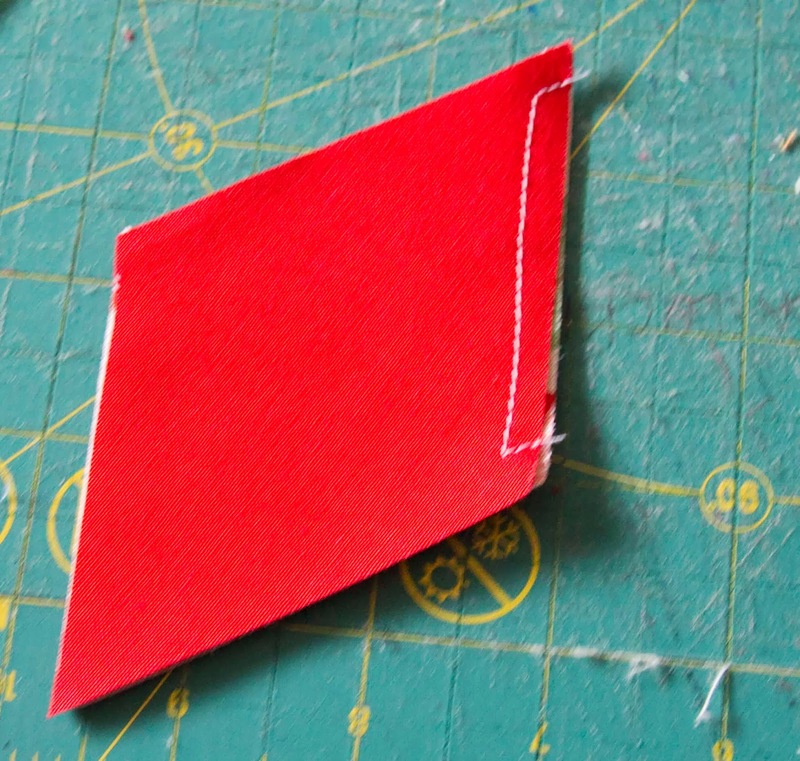 Mark the 1/4″ seam allowance along one side as shown. 11. 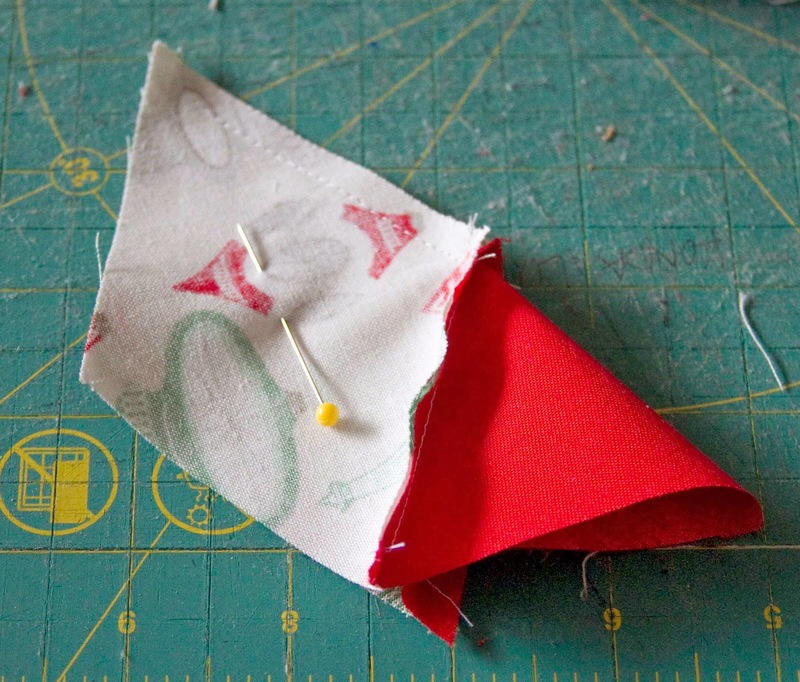 Pin the two halves together and sew along the marked line. 12. Press seams in a circle and press seams open in the middle rotating in the opposite direction. 13. Take one of the light diamonds. Align and pin it onto one dark diamond as shown. 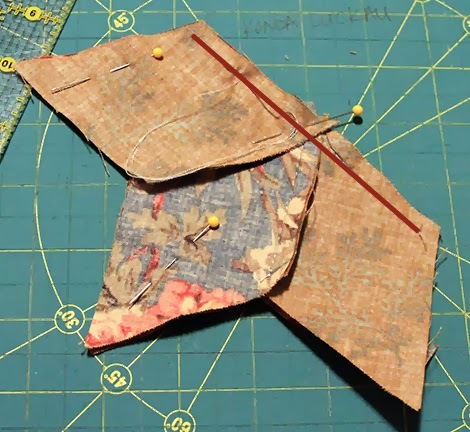 Sew along the marked seam allowance. Knot thread, but do not cut. 14. Align the light diamond to the next dark diamond. 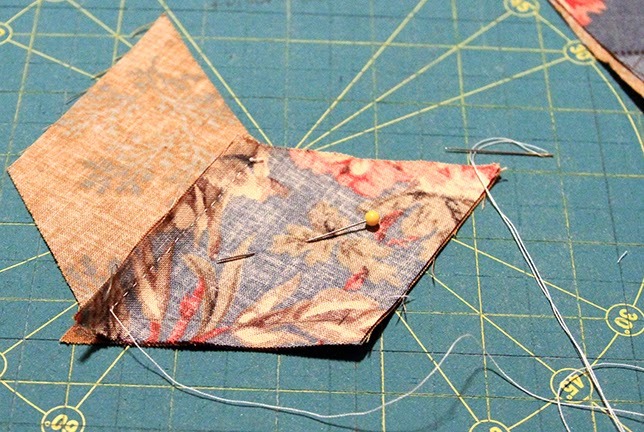 Pin and sew the next marked seam allowance. Knot thread again, but do not cut unless you need to. 15. Repeat with the next light diamond. 16. Continue sewing the light diamonds around the dark star. 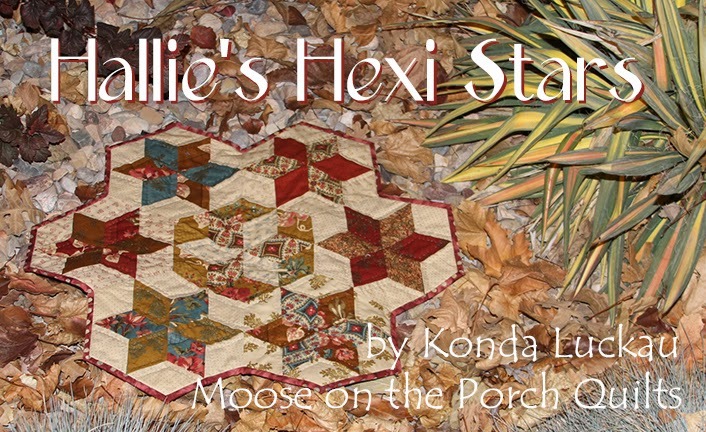 That makes one Hexi Star. 17. 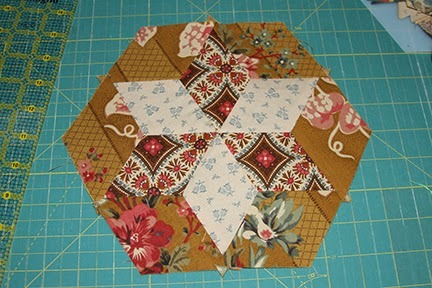 Repeat to make six Hexi Stars with a dark center and light edges. 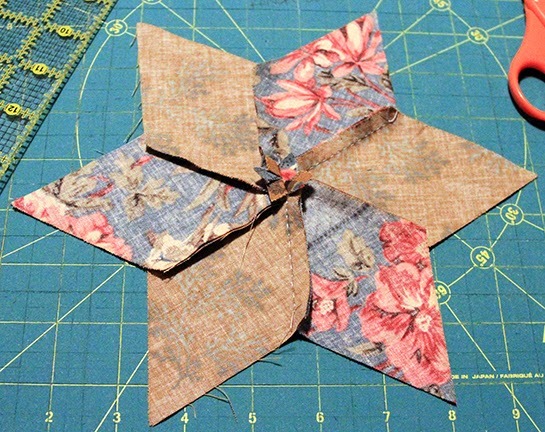 Make one Hexi Star with a light center and dark edges. 18. When pressing, always rotate seams. 19. 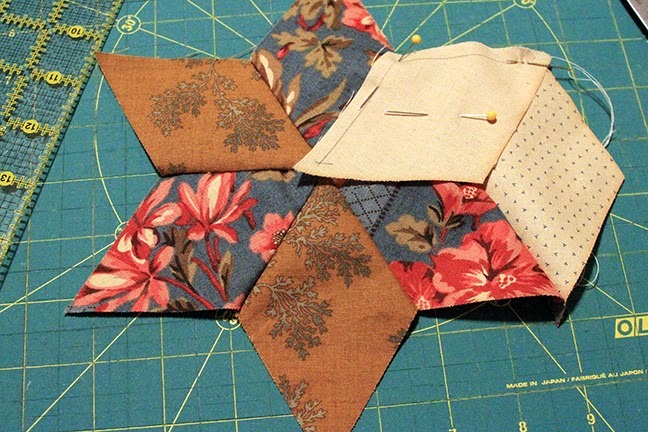 Lay out seven Hexi Stars as shown. Hand piece in the same manner. 20. Layer backing, batting, and top. Baste with pins or spray. 21. Hand or machine quilt. 22. 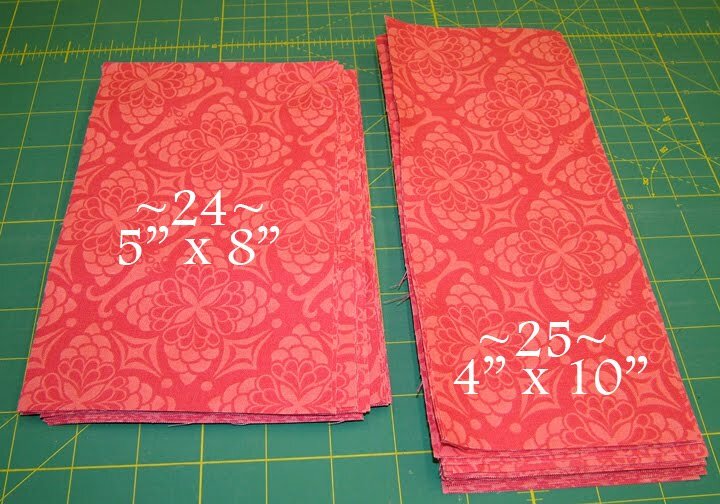 Cut the 1/2 yard of binding fabric into 2 1/2″ bias binding. Bind. 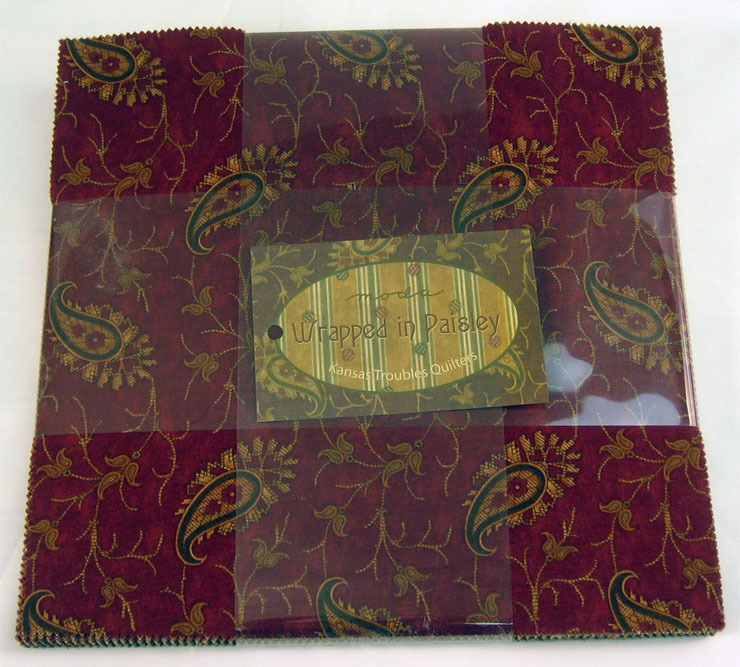 One approximately 24″ table topper that you will be very proud to show off! 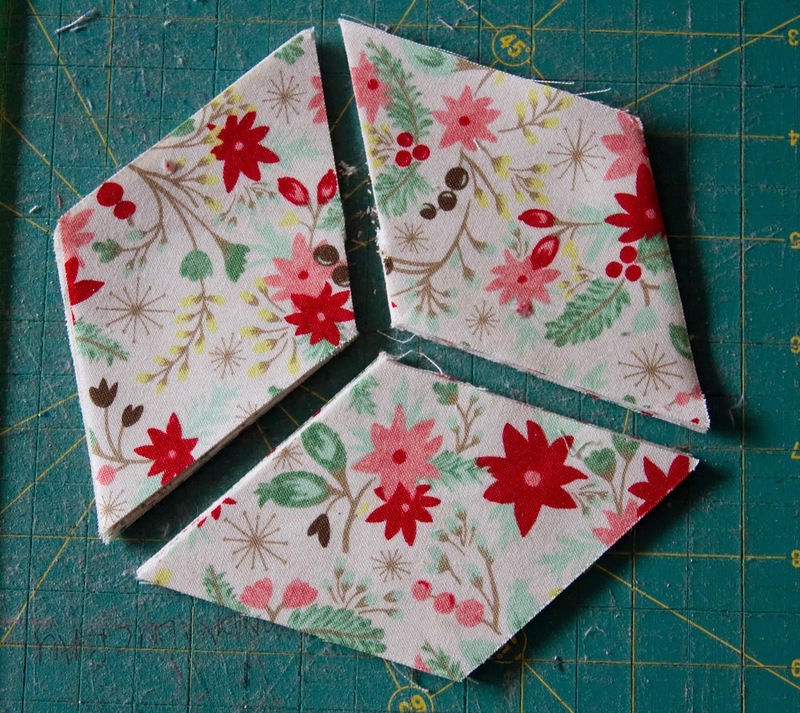 I hope you will give hand piecing a try. If you do, I would love to see it! My email is kluckau(at)moosequilts.com. I hope you have as much fun as I did! Hi! 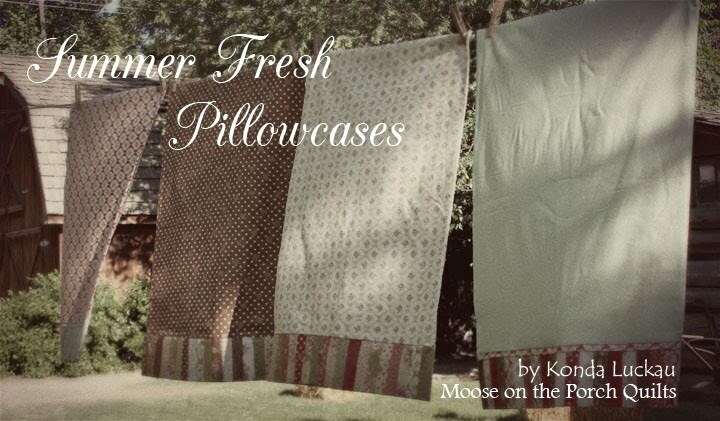 I’m Konda Luckau of Moose on the Porch Quilts. 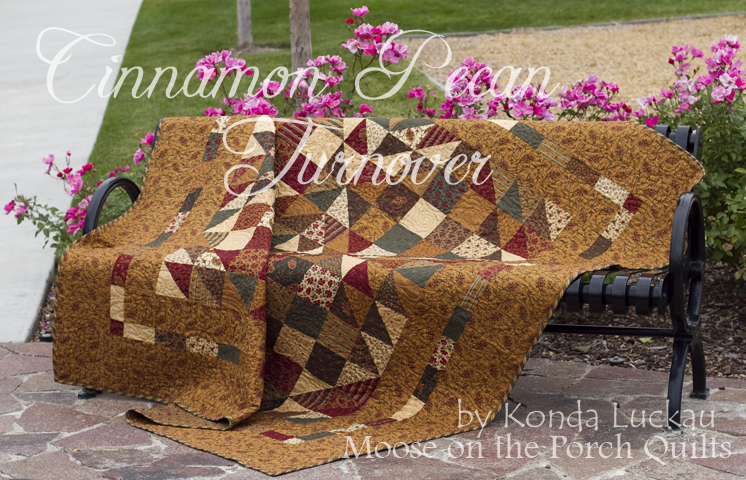 I’m excited to share this quilt with you! 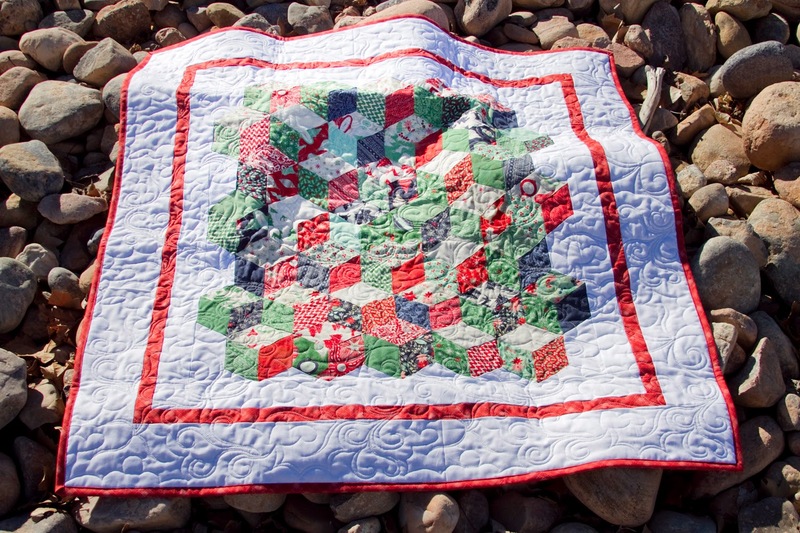 I made a quilt in the delectable mountain pattern with charm squares that is in my book Simply Charming Fun. When I showed it to a friend of mine, she suggested I make one with a layer cake. What a great idea! 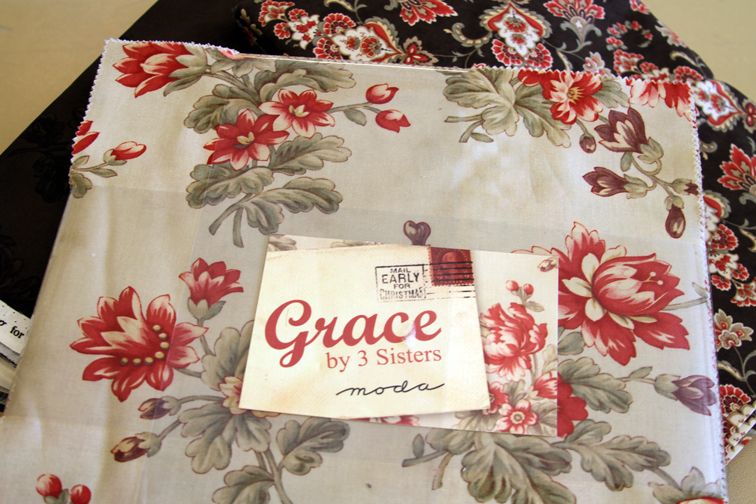 When I saw Grace by 3 Sisters, I knew that is what I wanted to make my quilt out of. I used a different layout with the pattern for this queen size quilt. 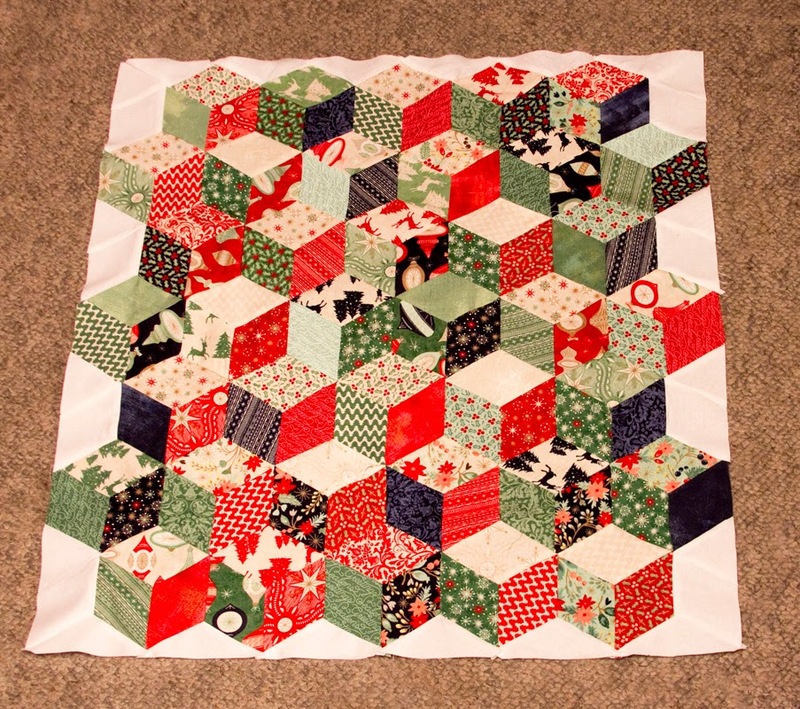 As I sewed the quilt, I thought about the name of the fabric, Grace, and about the Christmas Season. 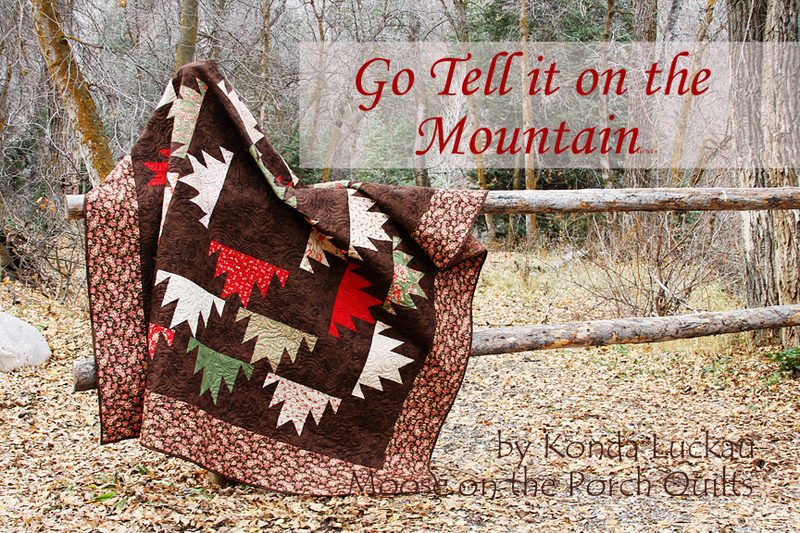 Combining that with the delectable mountain pattern that I was sewing, the name “Go Tell it on the Mountain” came. I liked it because it made me feel like singing while I was sewing. 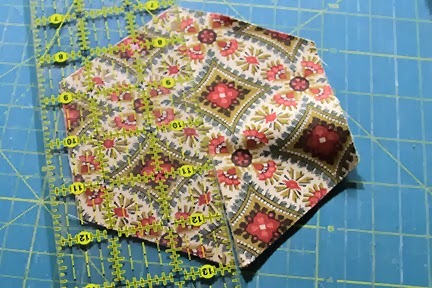 A layer cake makes this traditional pattern quick and fun! 1. 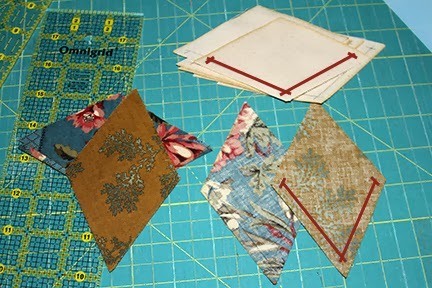 Take 24 of the layer cake squares and the 24 — 10″ background squares. Draw a diagonal line on the back of all of the layer cake squares. 2. 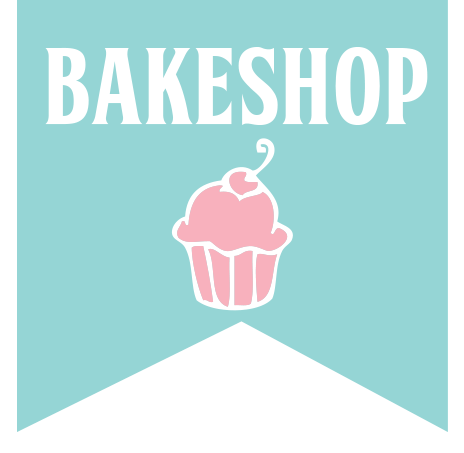 Take one layer cake squares and one 10″ background square. 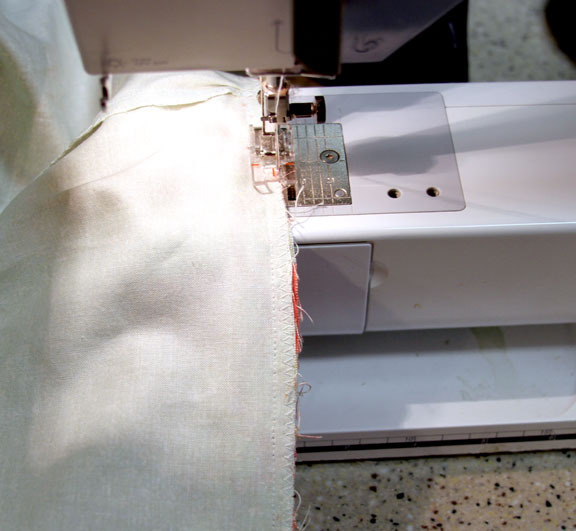 Place them right sides together and sew a scant 1/4″ seam on BOTH sides of the line and cut on the line as shown below. 3. Repeat with all 24 layer cake squares and 24 background squares. 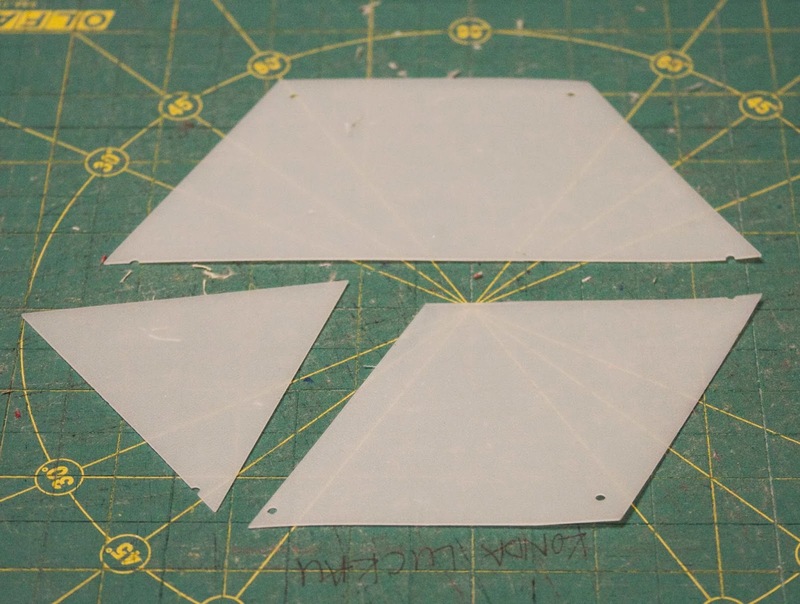 This will make 48 half square triangles. Square up to 9 1/2″ as shown below. 4. Press open as shown below. 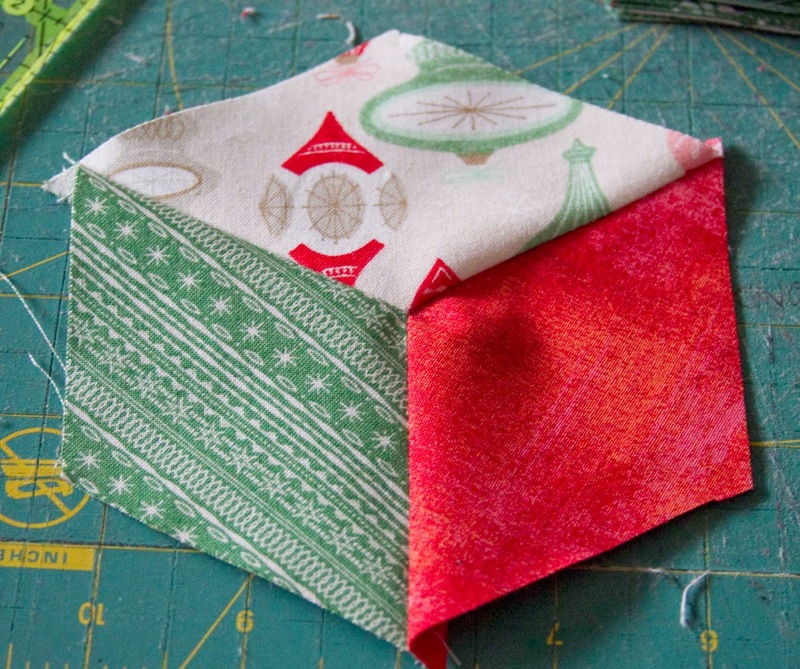 Make two identical stacks of 24 half square triangles. 5. **CAUTION** Each stack will be cut differently. 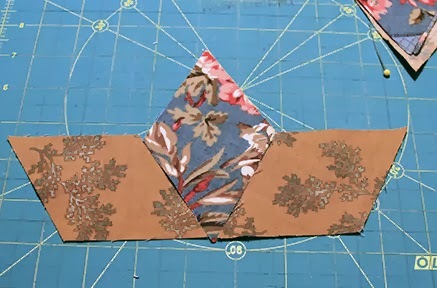 There are two half square triangles from each layer cake fabric. Make sure that the two identical halves are cut differently. Also, sometimes using this method, you can cut two at a time as shown below. This is NOT one of those times. I tested this for you. I probably should have picked a new layer cake square, but I decided to leave it. If you cut two at a time this way, your mountains won’t match up. 6. Now that you know what not to do, take one of the stacks and cut it into three 3″ strips as shown below. 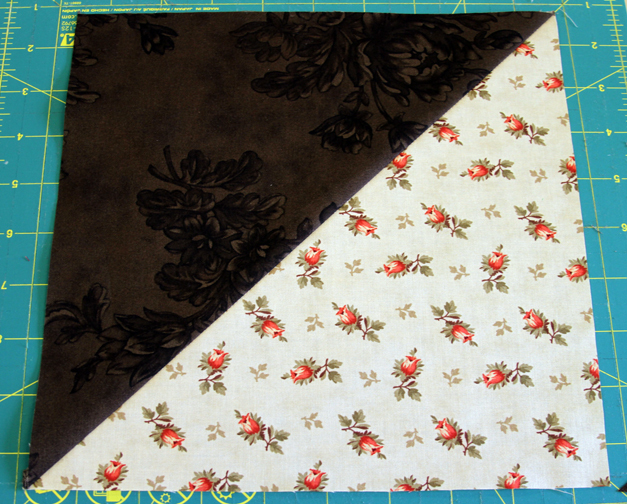 The leftover should be mostly background with a small corner from the layer cake print. 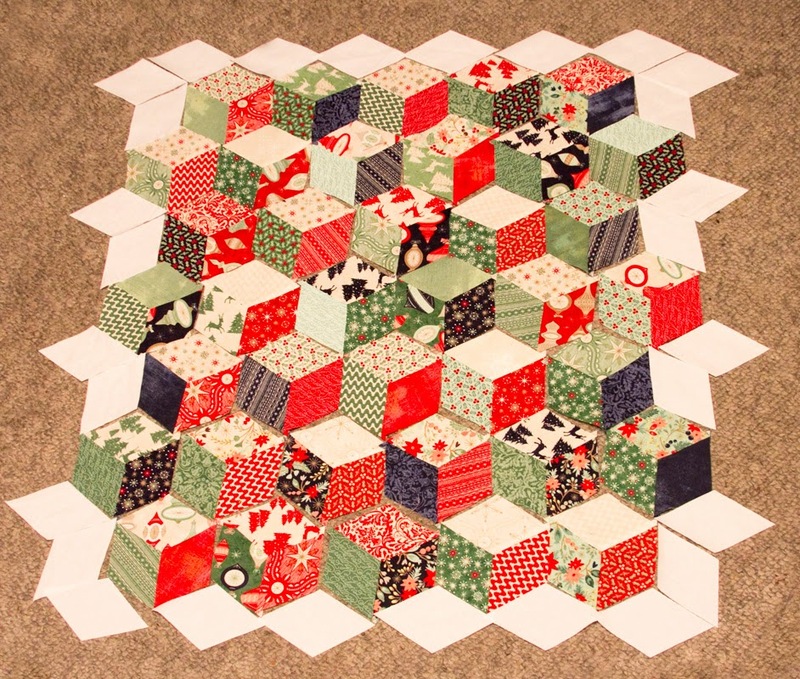 I actually liked to cut and sew one block at a time, so I didn’t get things mixed up. 7. After you cut the three 3″ strips, swap the two outer strips and add one of the 2″ x 9 1/2″ rectangles to one side as shown below. 9. Now for the other stack. It gets cut into 3″ strips with the diagonal starting in the opposite direction as shown. The leftover piece is still mostly background with a small corner from the layer cake print. 10. 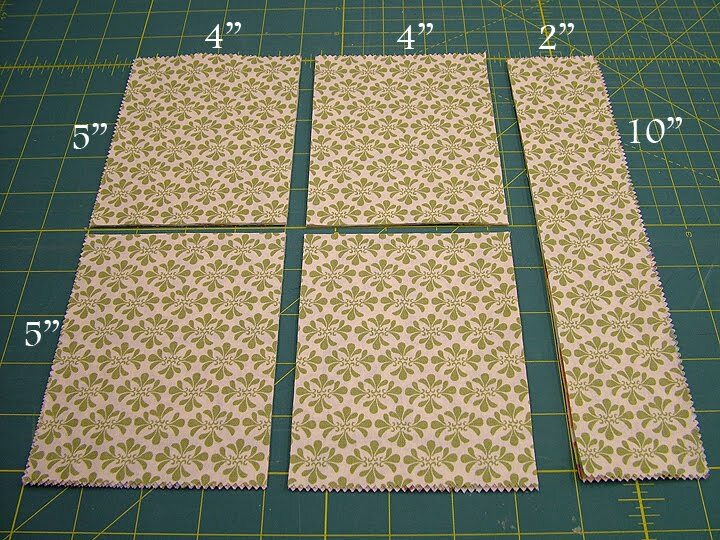 Then, just as before, switch the two outer strips, add one 2″ x 9 1/2″ background rectangle and sew them together as shown below. 12. 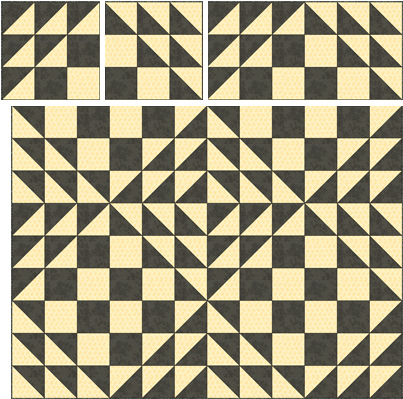 Take all 48 of your mountain blocks and the 16 — 9 1/2″ background squares and layout the quilt as shown. 14. 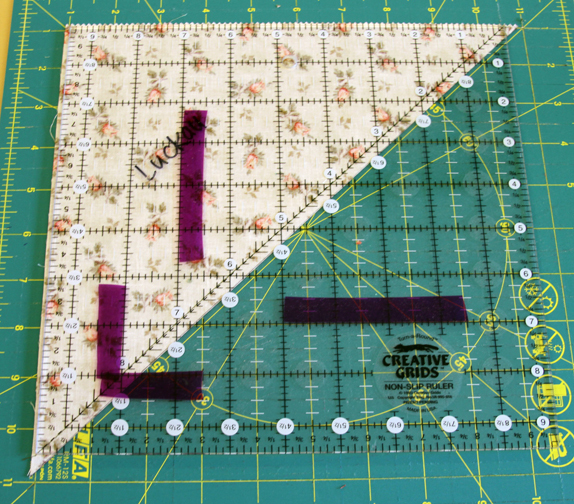 Take the 8 — 2 1/2″ background strips for the inner border. 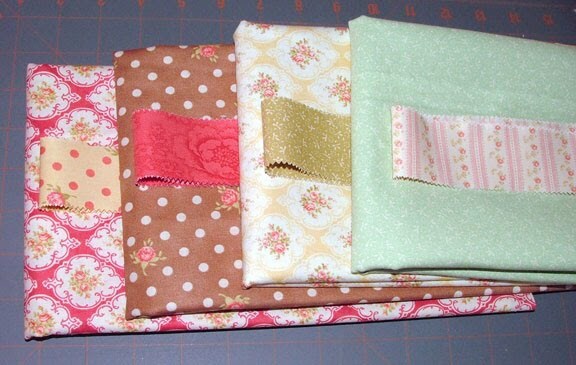 Sew them together into 4 pairs. 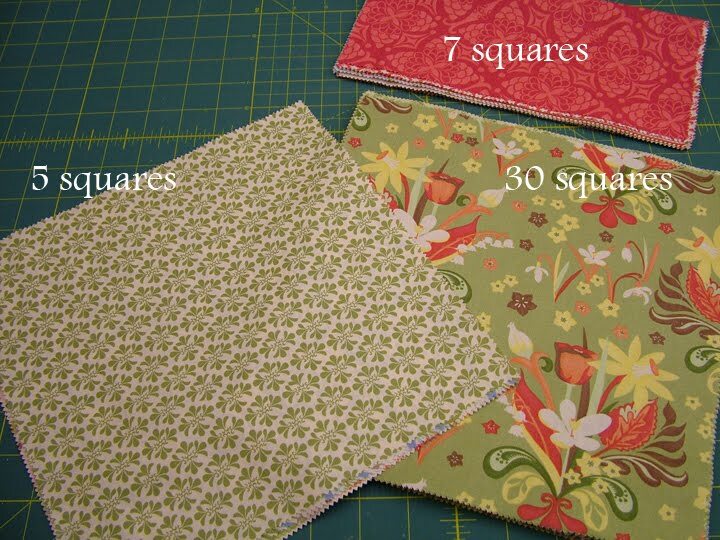 Trim two pairs to 72 1/2″ or the length of your quilt center. 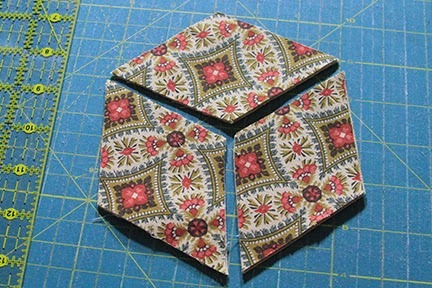 Sew these to the left side and right side of the quilt. Press. 15. 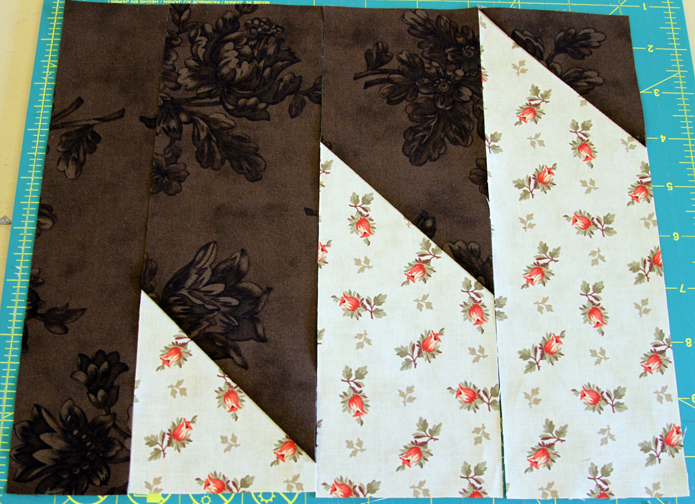 Trim the other two pairs to 76 1/2″ or the length of your quilt center with the two side borders added. 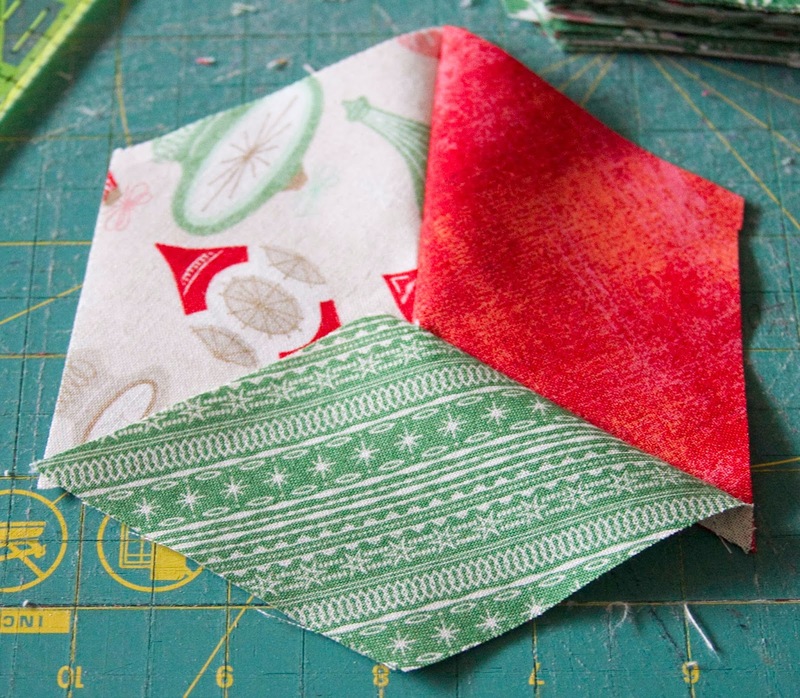 Sew these two lengths to the top and bottom of your quilt. 16. Take the 9 — 9 1/2″ border strips. Take 8 of them and sew them into 4 pairs. Take the last strip and cut it in half. 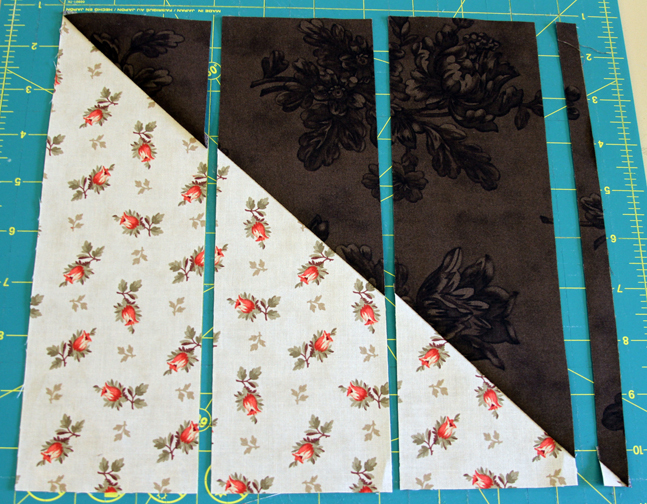 Sew each half to one long border length. 17. 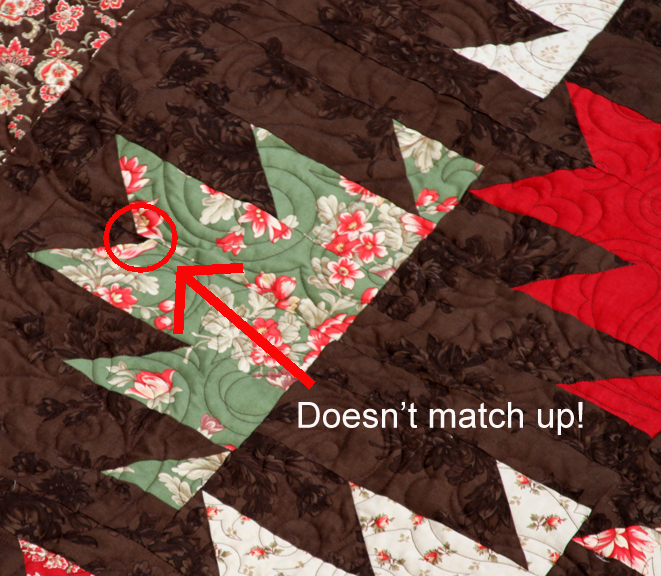 Trim the two shorter lengths into 76 1/2″ or the length of the two sides of your quilt. 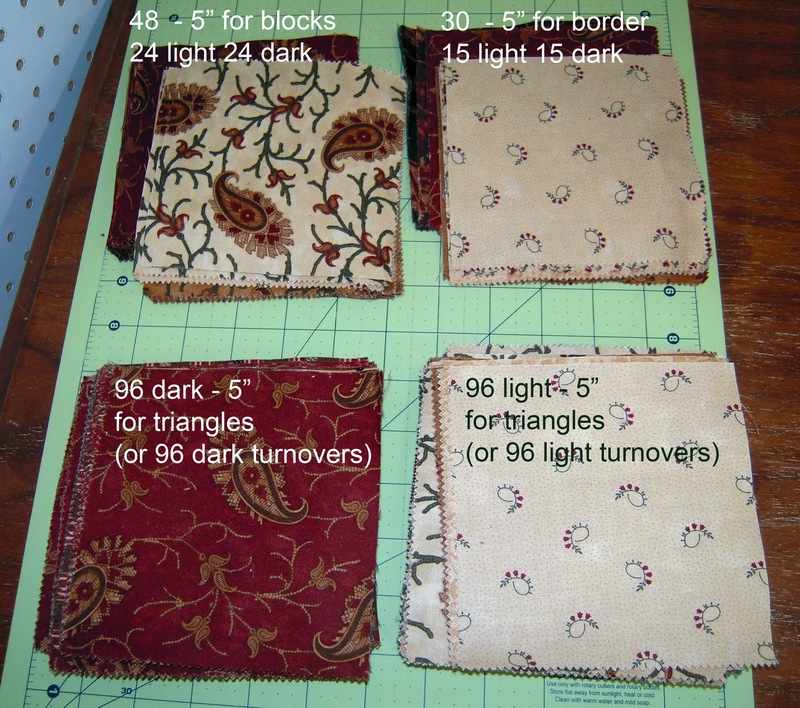 Sew these lengths to the left side and right side of the quilt. Press. 18. 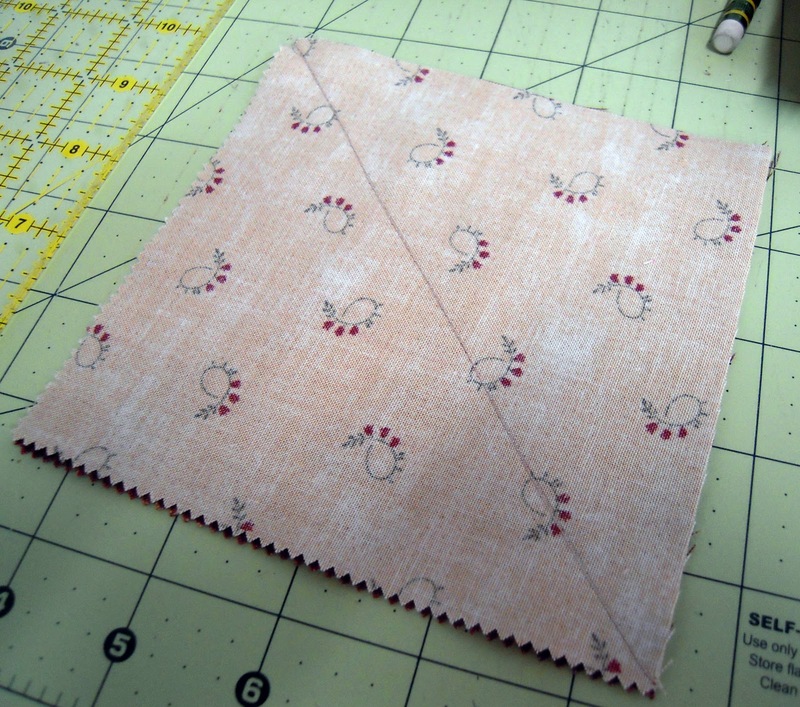 Trim the two longer lengths into 94 1/2″ or the length of the top and bottom of your quilt. 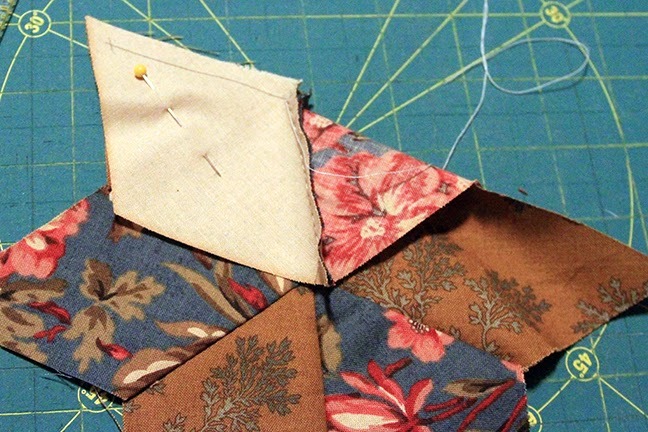 Sew these lengths to the top and bottom of the quilt. Press. 19. 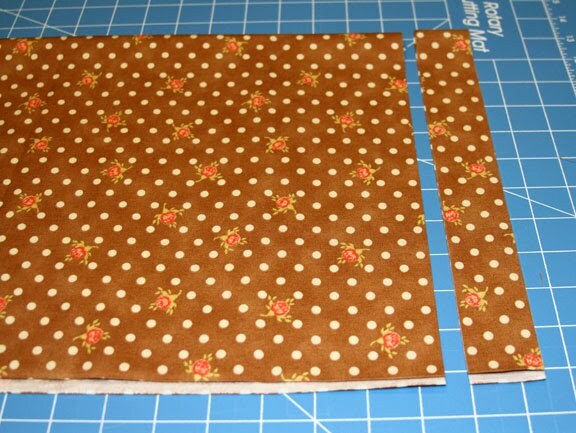 Cut the backing fabric into 2 — 3 yard pieces and one 1 1/2 yard piece. 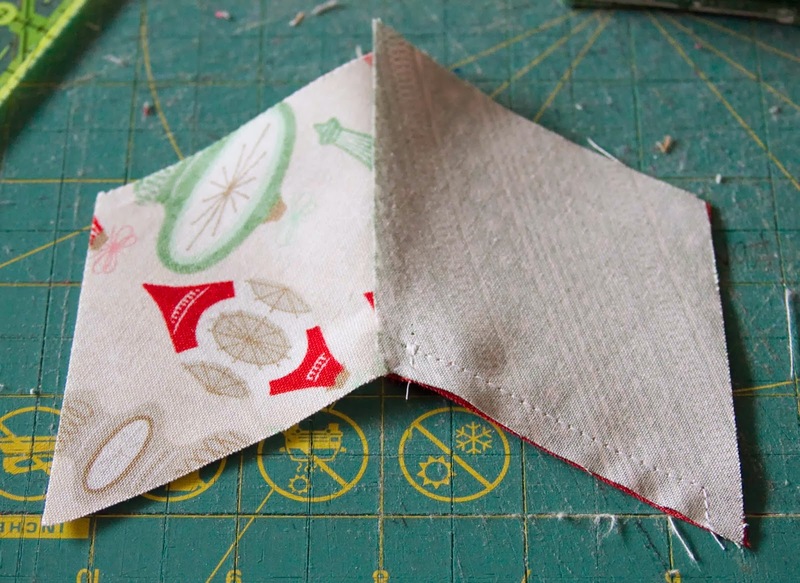 Cut the 1 1/2 yard piece in half along the fold parallel to the selvage. 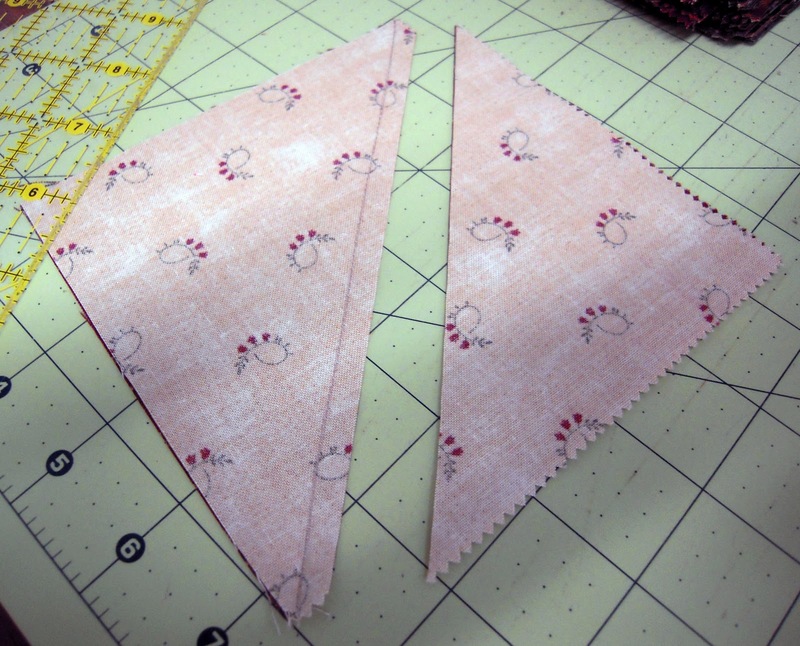 Sew them back together along the short side so the length is about 20″ x 3 yards. 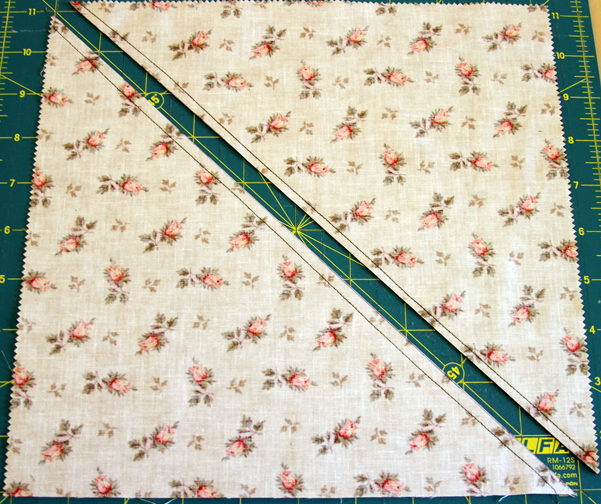 Sew this lengths between the 2 wider three yard pieces to make the backing. 20. Quilt as desired. I quilted it with a paisley design. 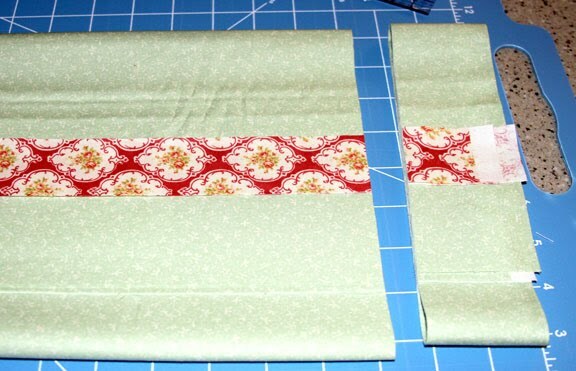 Use the 10 — 2 1/2″ strips for binding. 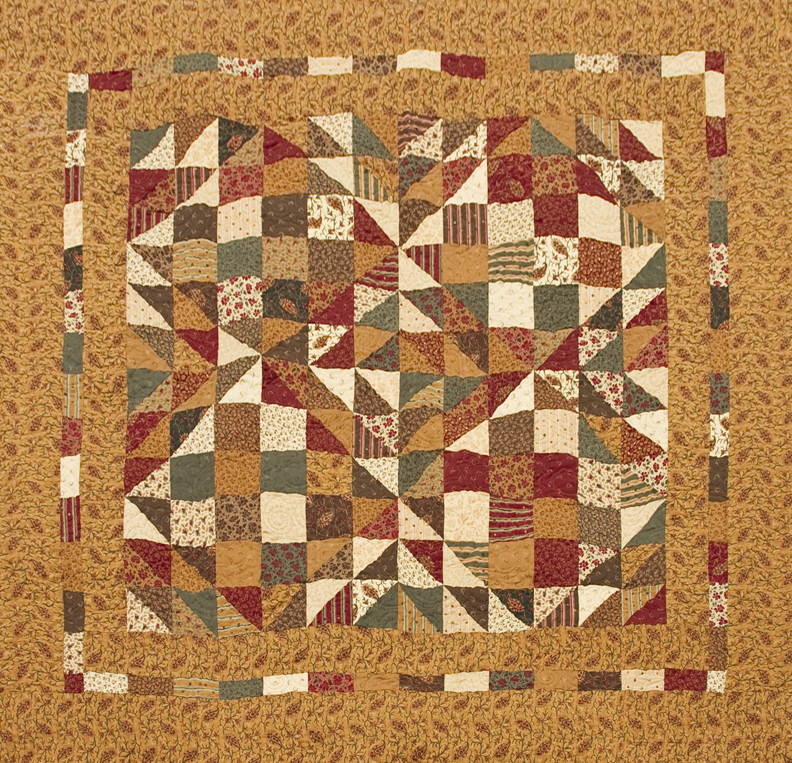 One queen size quilt 94″ square. 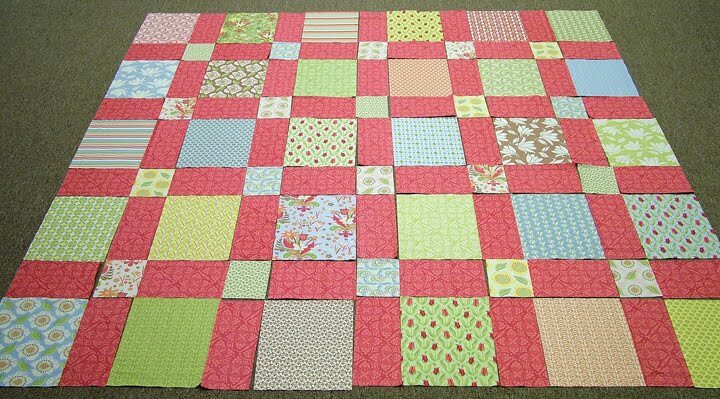 Because this quilt only takes 24 layer cake squares, there are enough squares leftover to make a smaller quilt. It takes 12 squares to make the center two rings of mountains. Hi! 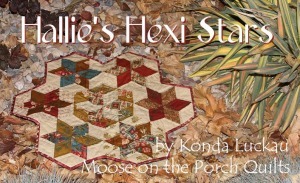 My name is Konda Luckau from Moose on the Porch Quilts. 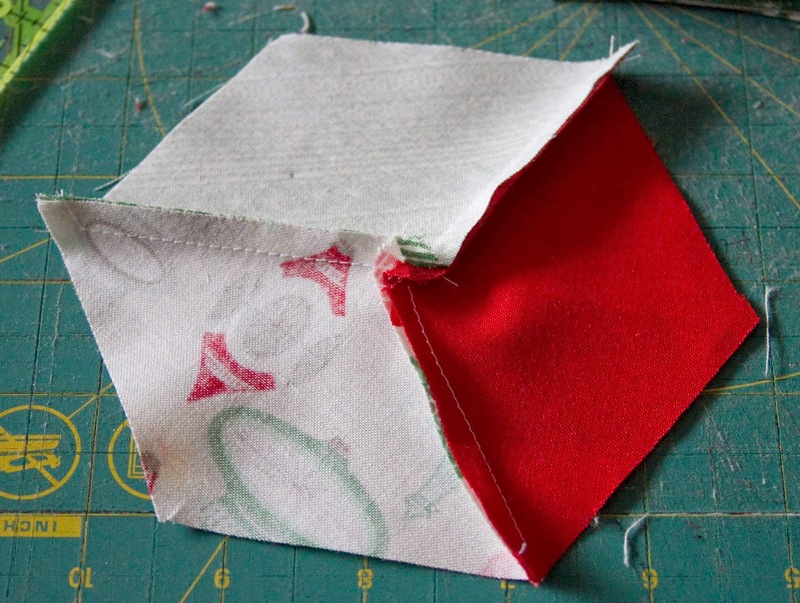 I love making quilts that are quick and easy, and I love how precuts speed up the quilting process. Kate Spain’s new line Verna is perfect for chasing away winter. I almost changed the name of the quilt to “Tut Tut Looks Like Spring,” but I got a blank stare in response, I left the original name. In case you also have a blank stare, it is a play on Winnie the Pooh and what I was thinking as I was photographing this wonderfully spring looking quilt in the snow. 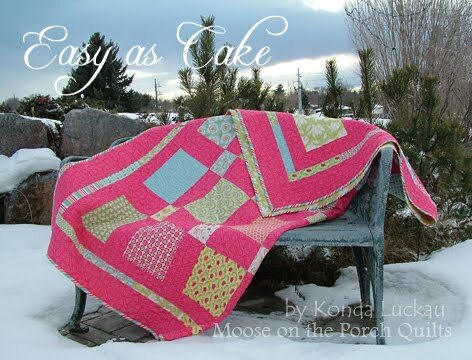 This pattern would look great with absolutely any layer cake. What about A Breath of Avignon or Oz with white sashing, Butterfly Garden or Looking Back with tan sashing, Blush with light pink sashing, or Attitude Girls with black sashing? I think I might need to make another one. 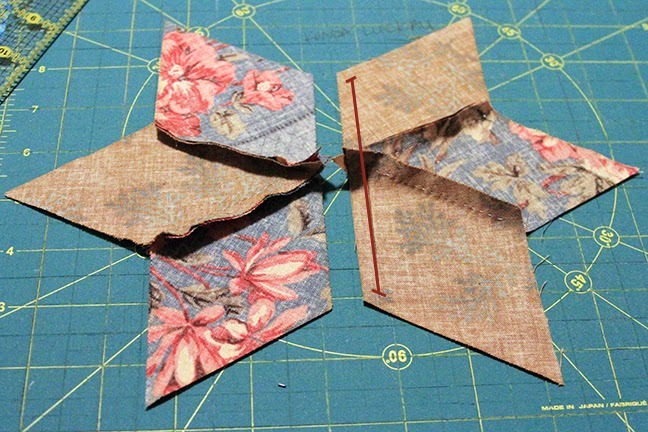 2) Take the 5 blocks for the sashing and first cut 2″ off one side. 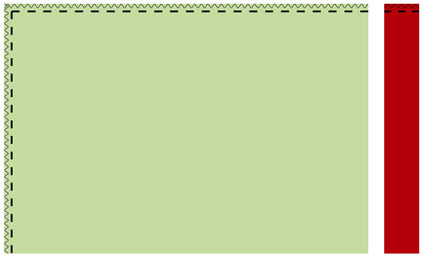 Cut the remaining 8″ x 10″ rectangle in half horizontally and vertically as shown below. 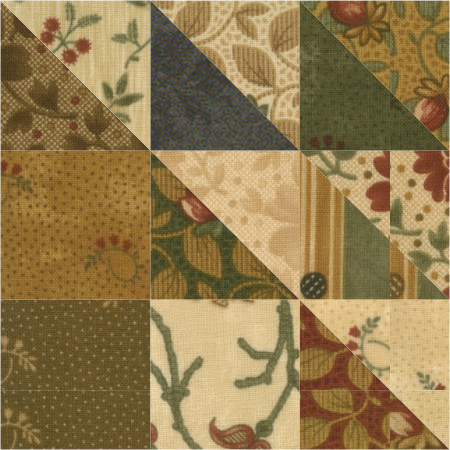 Now there are 20 — 4″ x 5″ sashing posts and 5 — 2″ x 10″ strips set aside for the 2nd border. 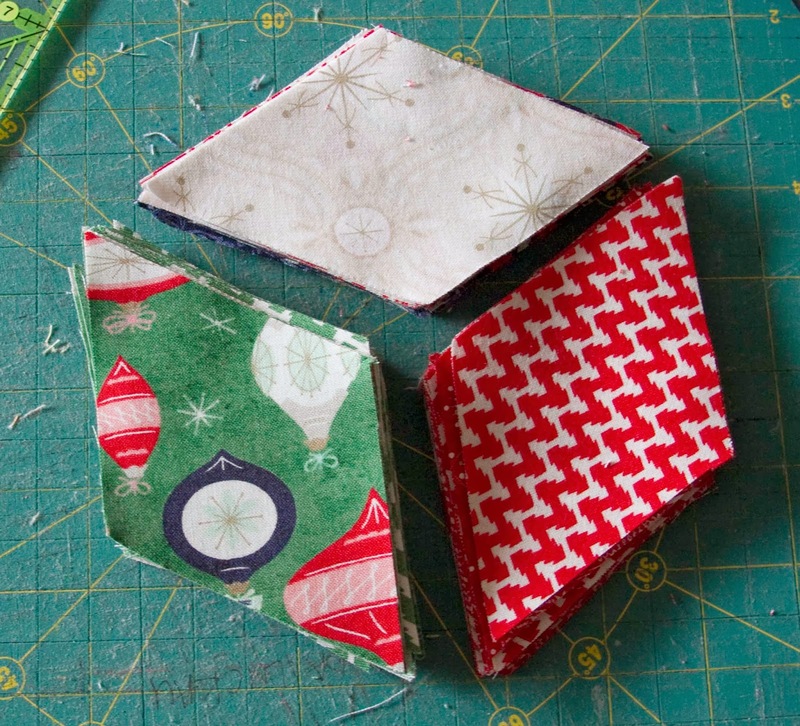 3) Take the 30 squares for the blocks and cut 2″ off one side. 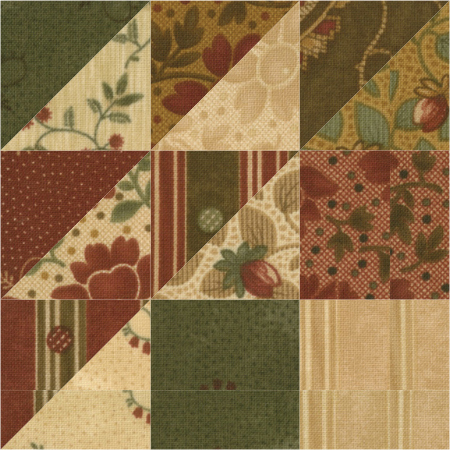 Now there are 30 — 8″ x 10″ blocks and 30 — 2″ x 10″ strips set aside for the 2nd border. 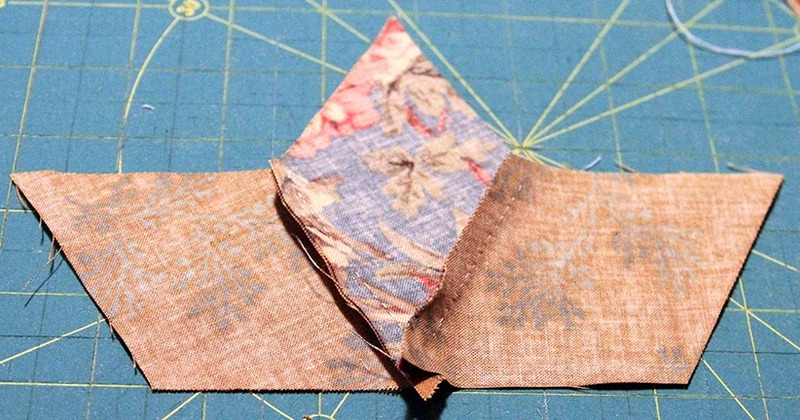 5) Take the 5″ sashing strips. 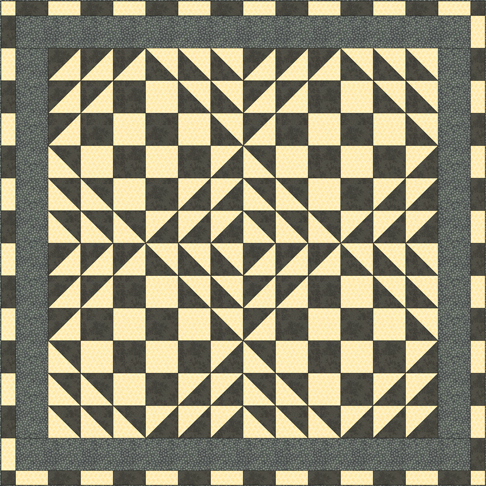 Subcut into 24 — 5″ x 8″ horizontal sashing rectangles. 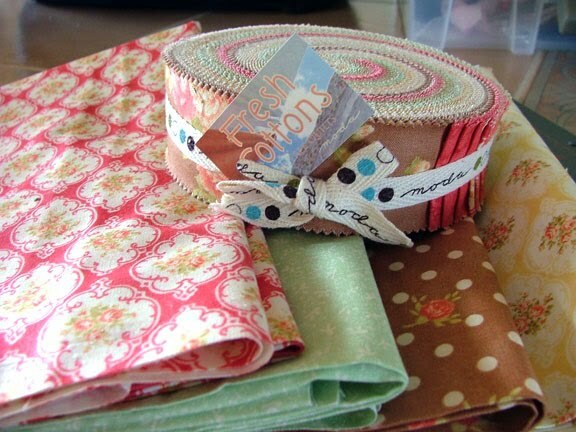 Take the 4″ sashing strips. Subcut into 25 — 4″ x 10″ vertical sashing rectangles. 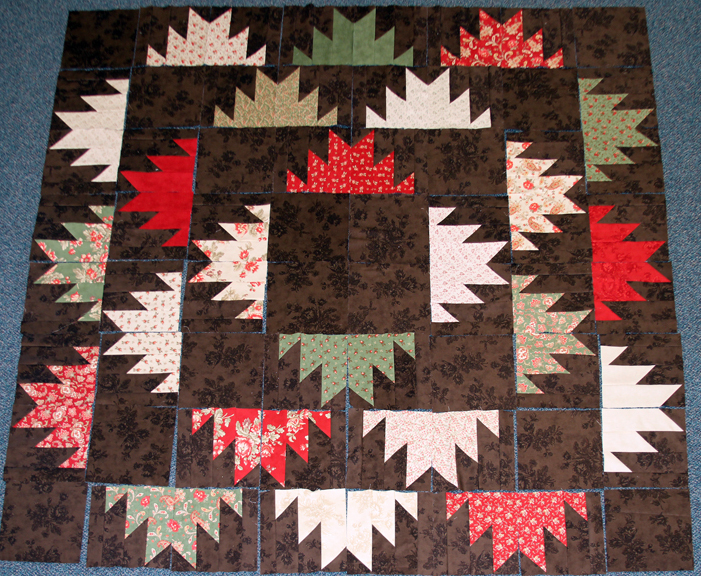 6) Lay out the quilt 6 blocks across and 5 blocks down as shown below. 7) Assemble the quilt center. 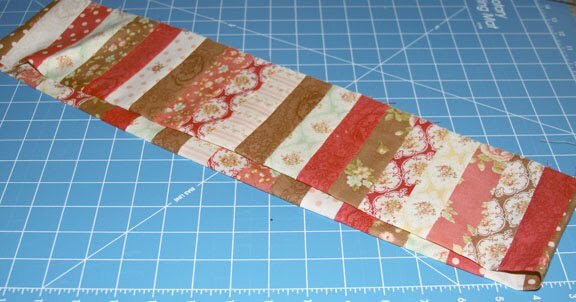 8) For the 1st border, take the eight 3 1/4″ strips. Sew them into 4 double strips. 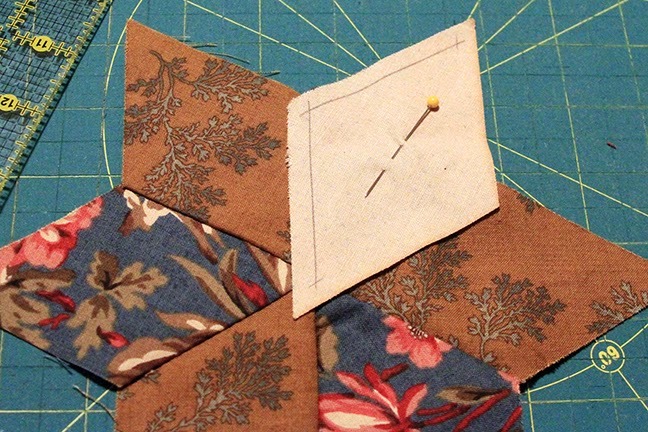 Sew one onto the left side of the quilt and another onto the right side of the quilt. 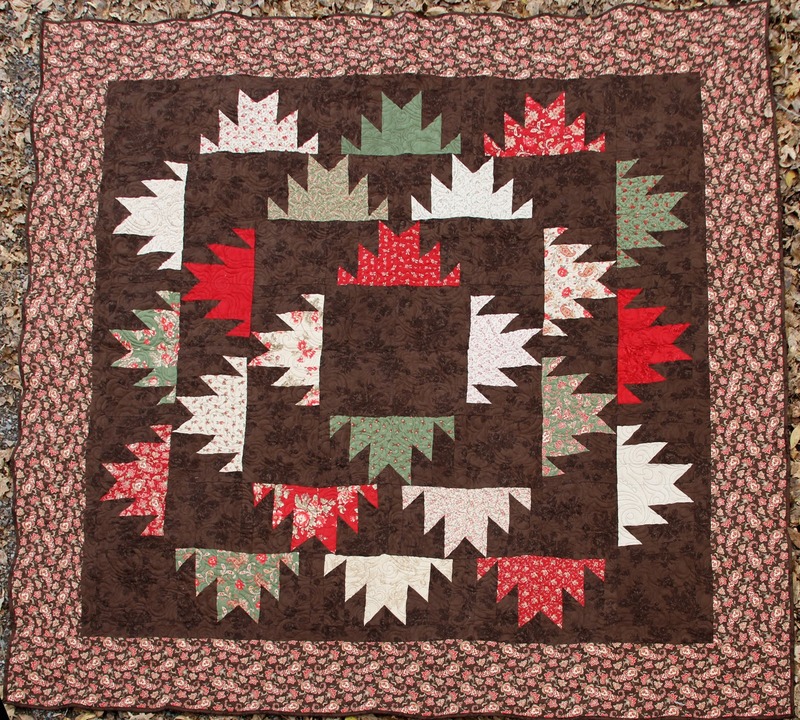 Then sew one onto the top of the quilt and the last one onto the bottom of the quilt. 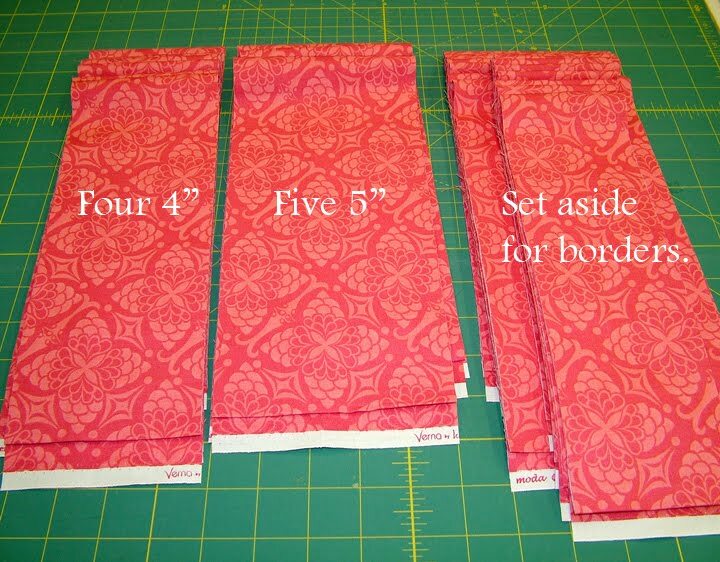 9) For the 2nd border, take the 35 — 2″ x 10″ strips. 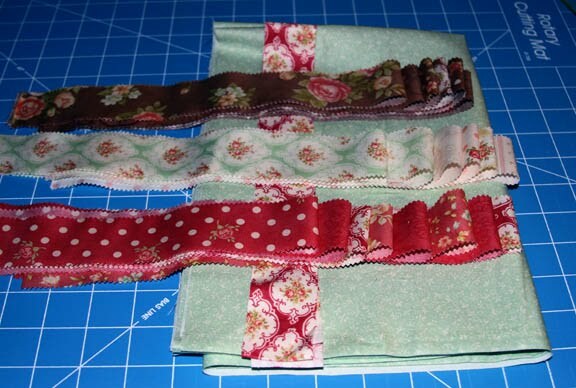 Sew them randomly into 4 sets of 8 strips so there are 4 long skinny strips for the 2nd border. 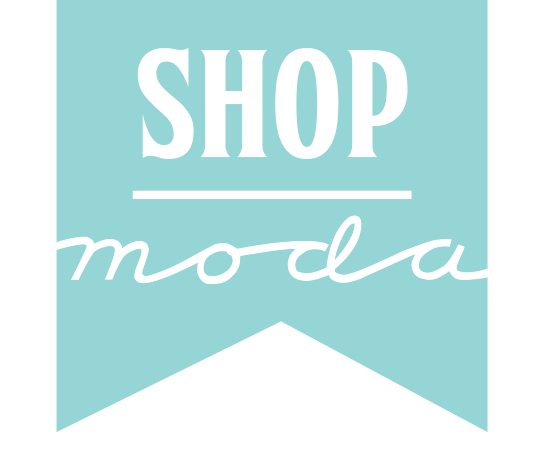 (You will not use 3 of the 2″ x 10″ strips.) 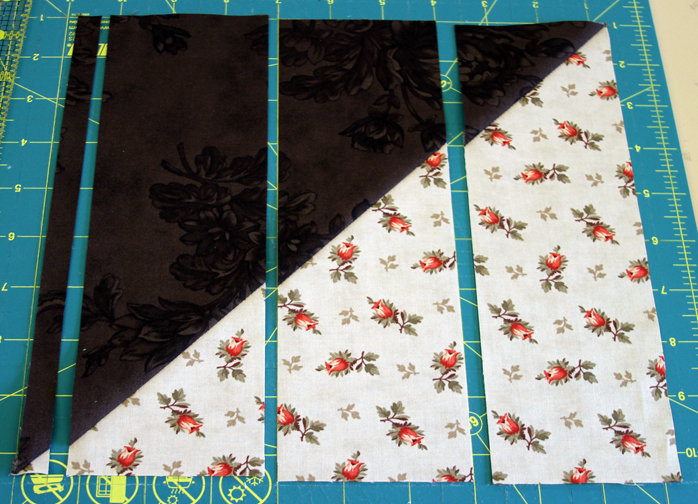 First sew on the left and right borders, then sew on the top and bottom borders. 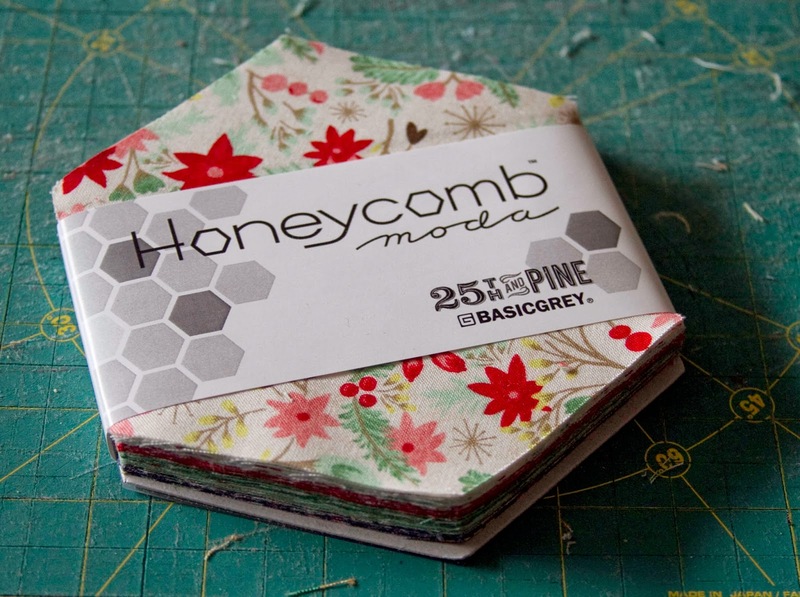 10) For the 3rd border, take the eight 5″ strips. Sew them into 4 double strips. 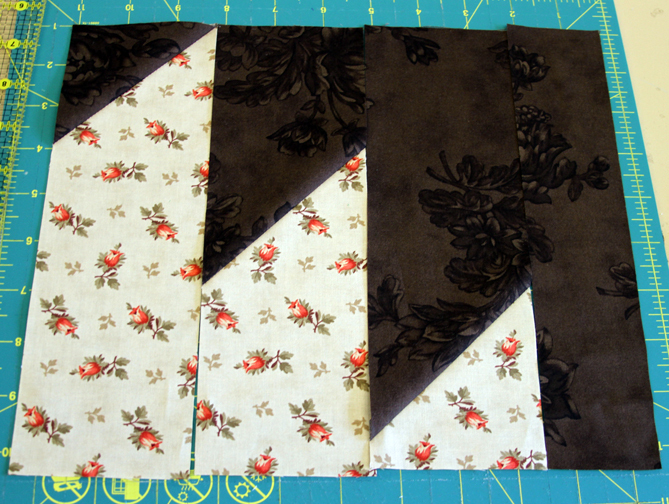 First sew on the left and right borders, then sew on the top and bottom borders. 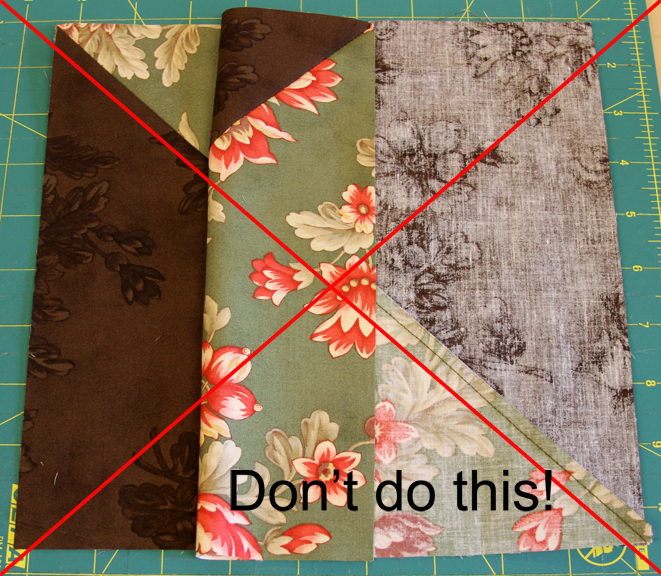 11) Quilt as desired and bind as shown below. 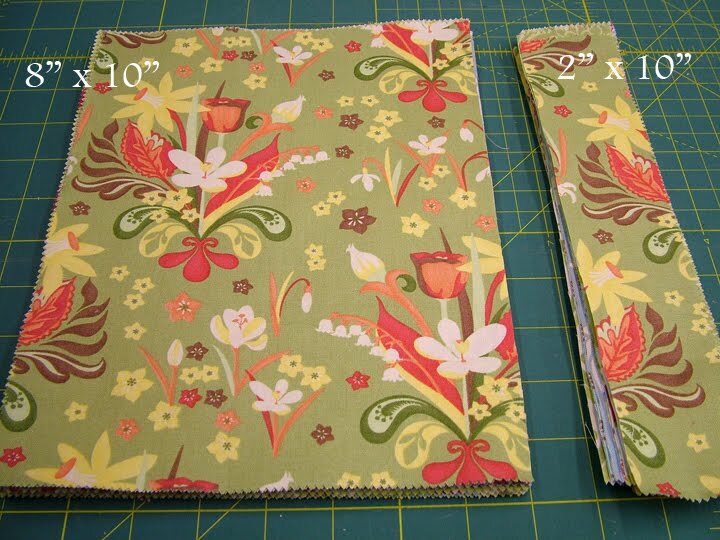 You will need nine 2 1/2″ strips for the binding. One 82″ x 85″ Queen size quilt perfect to put on a bed, take on a picnic, or give as a wedding present for someone special.